Monoculture: Is it really the problem ‘intensive agriculture’ critics make it out to be? This title is stark. Stay with me. This is not a hit piece on Michael Pollan. This is a disturbing story about the misuse of the power of journalism by one of the most, if not the most, influential food writers in the world. Michael Pollan is a big deal, arguably more influential on agriculture policy than the Secretary of Agriculture and certainly one of the most powerful figures in journalism. He is the author of five books, all best sellers, professor of journalism at the University of California-Berkeley and one of the most cited and quoted commentators on food and the farm in the world, with more than 330,000 followers on Twitter, many of whom consider him a hero. Although the public perception of him is just the opposite, he is not a reputable science journalist or—by his own admission—an objective reporter—on organics or agriculture. Why? 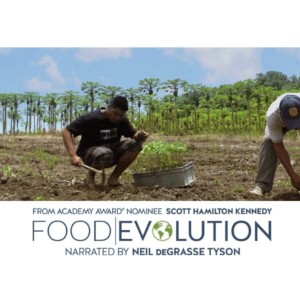 Because Pollan dissimulates when it comes to discussing agricultural genetic engineering—GMOs. He fiercely rejects the characterization that he is a “dyed-in-the-wool opponent of genetic engineering,” as he has put it, and in judiciously selected interviews, he presents himself as a moderate on the controversy. “I haven’t seen any evidence that’s persuaded me that there’s any danger to health [from GMOs],” he said on National Public Radio just last week. GMOs are not harmful, Pollan appears to be saying in these interviews, but he believes that its current uses promote large-scale agriculture, which he abhors. Fair enough. If that were the essence of his views, he’d be a welcome contributor to a necessary public discussion about the future of farming and food. But what is the real world according to Pollan? What does he say and write when he is not among friends at Grist or participating in fawning PDAs with a fellow foodie for Smithsonian magazine. The reality is that Pollan regularly, and increasingly, talks out of both sides of his mouth—there, I wrote it—and because of his influence he is inflaming a discussion about crop biotechnology that has already gone off the rails. We caught a glimpse of the true Michael Pollan this week, and it wasn’t pretty. On Monday, an organization known as the European Network of Scientists for Social and Environmental Responsibility (ENSSER), issued a statement declaring, there is “No scientific consensus on GMO safety.” To those familiar with the science of GMOs and the safety testing record, the full statement reads like farce. It has 93 signators, not one considered a mainstream scientist—a ‘Who’s Who’ of anti-biotechnology campaigners. A recent paper by independent Italian scientists noted there have been 1783 studies on safety and health issues related to GMOs over the last ten years alone, including many publicly funded studies, confirming the safety of GMOs. The literal avalanche of GMO safety studies, short term and long, have prompted more than 100 of the world’s independent science bodies to conclude that foods made from genetically modified crops are as safe or safer than conventional or organic varieties. So who is behind this bizarre declaration? ENSSER, for those not familiar with it, is an organization with a mission. Its members believe—this is faith and not science— that the debate over GMOs is over, that the technology is harmful and should be banned or restricted out of existence. Its members are among the most high profile anti-GMO activists in Europe. Remember the pictures of rats supposedly twisted into cancerous monsters after eating GMO corn that were blasted across cyberspace and onto ‘laugh-out-loud’ pop shows like Dr. Oz? The rats were props for humans, according to the notorious 2012 Gilles-Erich Séralini study that stands as one of the most discredited experiments in scientific history. Séralini is a signee of this statement, along with co-author Nicolas Defarge, who is ENSSER’s Deputy Chairman. What did mainstream scientists—those without a precooked position on crop biotechnology, whose judgments are shaped by the evolving empirical evidence—have to say about the Séralini study? Six French national academies (Agriculture, Medicine, Pharmacy, Science, Technology and Veterinarians) issued an extraordinary joint statement condemning the study and the journal that published it. The paper was reviewed and refuted by the most prominent independent international science organizations and every food standards agency of note, including French HCB and the National Agency for Food Safety, the Vlaams Instituut voor Biotechnologie, Technical University of Denmark, Food Standards Australia New Zealand, Brazilian National Technical Commission on Biosafety and the European Food Safety Authority (EFSA). 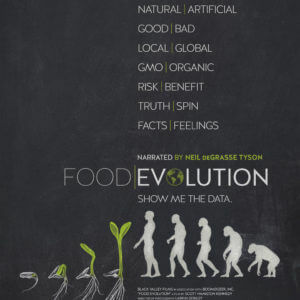 To mainstream scientists and science journalists, saying that GMOs pose any serious or unusual health threats is akin to climate change denialism or pretending that creationism should be discussed in the same breath as evolution. The only well known dissenters from this consensus are groups like ENSSER—and Michael Pollan, it appears. Does Pollan really believe that the opinions of activist scientists with avowed opposition to GMOs match the scientific weight of 100+ independent organizations? Considering Pollan’s influence, tweets like this are the journalistic equivalent of a prominent science journalist disseminating a study by creationists that suggests there is no science consensus on evolution. It’s a disturbing example of how Pollan views empirical evidence. Last year, without even reading the Séralini study (or just as likely and even more discouraging, being unable to critically interpret it) he jumped on the Séralini anti-GMO crusade bandwagon. 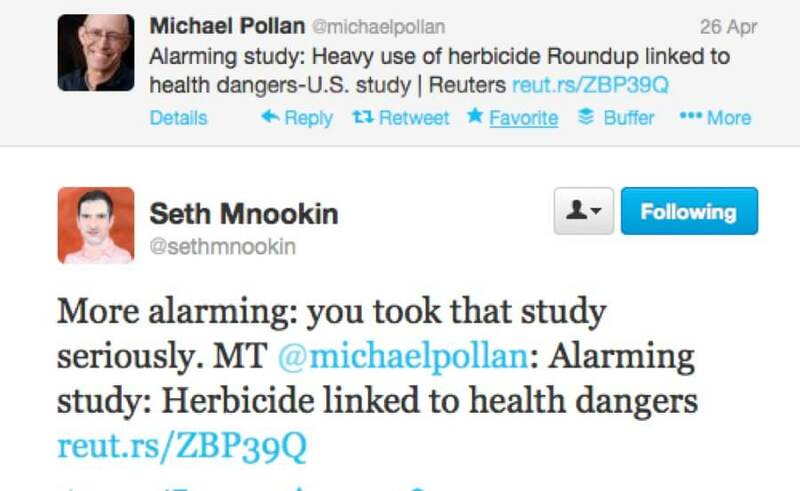 Pollan has a history of promoting discredited studies and alarmist claims about GMOs—more evidence in a moment. Equally disturbing, however, are his views about the responsibility of journalists to be objective truth tellers. Consider the telling interview Pollan gave last April to vegan alternative lifestyle promoter John Robbins. Robbins is co-hosting the upcoming anti-GMO online summit with Jeffrey Smith, the former flying yogic instructor, who has self-published two anti-GMO books and campaigns around the world as a crop biotechnology expert. Pollan is then asked about a highly publicized meta-study by independent Stanford University scientists drawing into question the claimed health benefits of organic meat and produce. The study was well received by scientists and in the mainstream science press and praised for its comprehensiveness, but it provoked a stream of savage challenges by organic activists, Pollan among them. Pollan then segued into a discussion about writing about food and agriculture, where he admits he is not an objective science journalist but an advocate for the industry that has made him a millionaire. He candidly says he manipulated the credulous editors at the New York Times, where he writes regularly, by presenting only one side of food and agriculture stories. The media has really been on our side for the most part. I know this from writing for the New York Times where I’ve written about a lot of other topics. But when I wrote about food I never had to give equal time to the other side. I could say whatever I thought and offer my own conclusions. Say you should buy grass feed beef and organic is better, and these editors in New York didn’t realize there is anyone who disagrees with that point of view. So I felt like I got a free ride for a long time. And then about two years ago maybe three years ago the industry decided they had to fight back and since then they’ve organized a very well-funded PR campaign that sometimes you’ve seen some evidence of… There is something called the Food Dialogues presented in various places to talk about how food is produced and greater transparency and I found this. … And, they are lobbying newspapers and editorial boards saying you have to give equal time and so you see all these kind of anti-locavore pieces and pro-GM pieces on the op-ed page everywhere. So I think they have kind of spooked the newspapers into realizing they need to give equal time on this issue and it is an issue with two sides. Related article: Glyphosate traces found in wine: Should we be concerned? For those who follow social media, the sharp dichotomy between Pollan’s crafted image as intellectual diplomat and his actual actions as anti-GMO pit bull are well known. 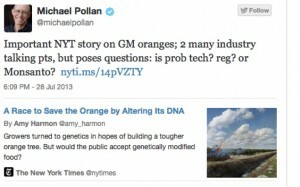 In August, in a tweet that prompted his redemptive interview with Johnson at Grist, Pollan flippantly attacked New York Times’ science reporter, Amy Harmon, who had written a remarkable piece—many in the science journalism community are convinced it will scoop up numerous awards for its clarity and thoughtfulness—about the potential use of genetic modification to save the bacteria-threatened Florida orange crop. Rachael Ludwick, a science geek and avid follower of the Twitter GMO debate scene, has cataloged many of Pollan’s recent, one-sided tweets. Pollan often serves as a vessel for the views of organizations scandalously known for their anti-science activism. 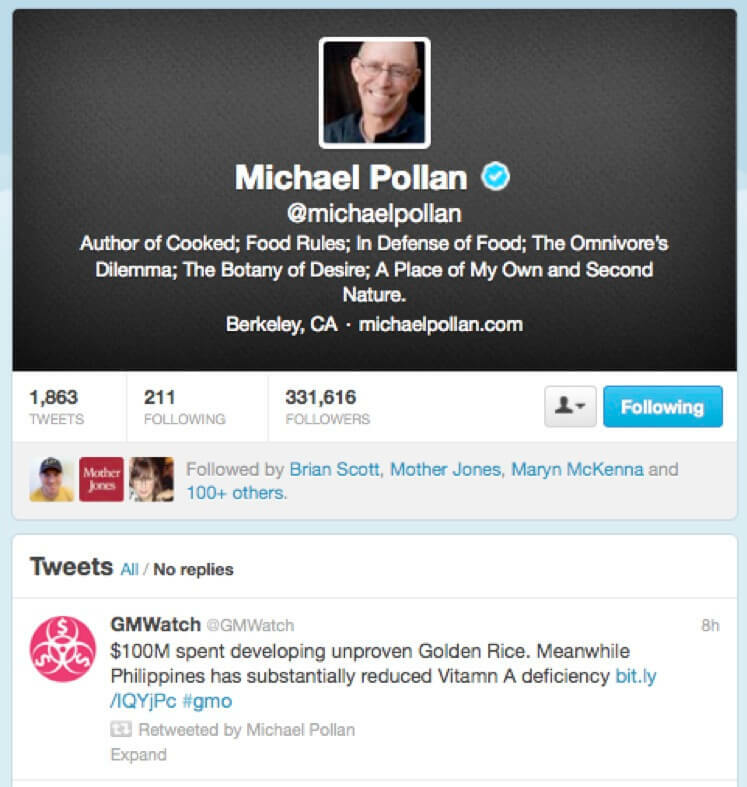 In this tweet, he promotes GMOWatch, a notorious NGO dedicated to undermining public support for vitamin A enhanced rice, which is potentially crop biotechnology’s ‘killer app’, as its success would directly challenge a central activist claim often voiced by Pollan that consumers reap no benefits from GMOs. Pollan was also one of the first anti-GMO activists, along with other ‘reputable’ media sources like NaturalNews.com, to promote the notorious findings by Australian researcher Judy Carman that alleged, in contradiction to numerous mainstream studies, that GMO corn caused irritation in pigs—claims since dismembered by a slew of scientists and journalists. These are not isolated examples. Almost weekly, Pollan can be found hawking one anti-GMO study or alarmist NGO claim. Pollan will undoubtedly try to reframe these tweets as caricatures of his true beliefs, that he was just noting a study or article or anti-GMO alert and not promoting it. That was his defense of his backhanded tweet on Harmon’s piece. 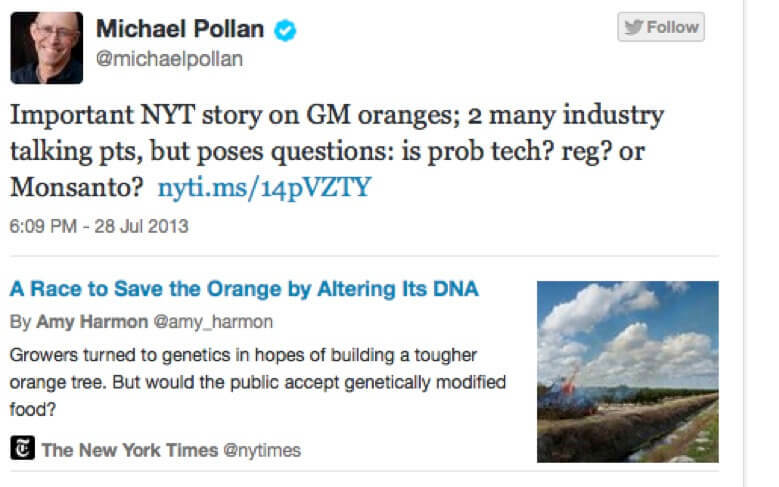 In the world according to Pollan, he’s a dedicated public journalist, sending email alerts about anti-GMO stories that he doesn’t really believe in. He’s just pro dialogue. But the evidence trail outside of Twitter contradicts him. Here Pollan praises the notoriously anti-science Center for Food Safety for being honest on the issue of GMO safety, contrasting it with Monsanto, and repeating the discredited anti-GMO talking point that GMOs do not raise yields or help feed the world. Here he accuses the agriculture industry of being immoral for discussing the role that next generation GM innovations, such as Golden Rice, with its established benefits for children, could play in encouraging a more balanced view of the technology. The U.N. International Panel on Climate Change recently issued a document that is considered the benchmark on climate science, concluding that human-induced global warming poses a serious threat. The report included more than 800 authors and 50 editors from dozens of countries took part in its creation. The latest report from the Intergovernmental Panel on Climate Change, the internationally accepted authority on the subject, concludes that scientists are 95 percent to 100 percent sure human influence has been the dominant cause of global warming. A total of 209 lead authors and 50 review editors from 39 countries and more than 600 contributing authors from 32 countries contributed to the preparation of that report. In other words, the broad mainstream consensus of the science community is that the planet is warming and humans are threatened. (What we should do about this threat is another issue, of course.) Sure, there are skeptical scientists. Just go to PetitionProject.org and read the statement supposedly debunking the consensus, with more than 31,000 signatures. But by now, responsible journalists recognize the difference between skeptics and denialists, and have adjusted their reporting accordingly. No ‘false equivalency.’ No attempts at fake balance. The encyclicals issued by science deniers are the functional equivalent of the European Network of Scientists for Social and Environmental Responsibility’s “no consensus” statement. 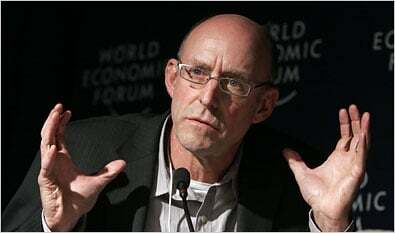 And Michael Pollan is a denialist. Worse, he has acknowledged that, when he can get away with it (and the New York Times is his forum of choice) he has no compunction about shaving the facts to present only one side of the GMO story—the denialist side. 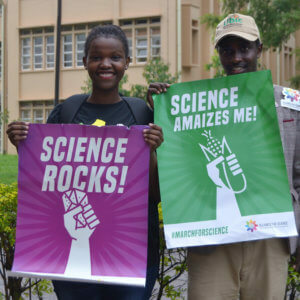 Scientists and activists at NGOs and journalists who decry the consensus on the safety of GMOs should not be featured in prominent newspapers; they should not be granted obsequious interviews to propagate their views. Where are the science reporters who vocally stand up for climate science but remain eerily quiet when junk science purveyors like Michael Pollan command the media and cyberspace? Anti-science denialists have no ethical right to promote their views on mainstream science sites—and that should include GMO denialists. Pollan is in a unique position, not unlike the situation that presented itself a few years ago to Mark Lynas, the British climate change journalist who professed to be driven by science on the issue of GMOs but often just echoed the clichés of the anti-technology left. He risked his career and environmentalist brand image by breaking with anti-GMO activists and declaring he was going to stand with the empirical evidence. There is now no more respected straight talker in the world on crop biotechnology. Pollan has built an empire of sorts and accumulated a small fortune by vividly chronicling the excesses of industrial agriculture—and the public should be grateful that he has stirred a healthy debate. But he’s lost his ethical barometer. Now it’s time for him to take a risk, and, like Lynas, stand up for science. It would mean not acting as a pass through for the latest junk claim. It would mean vocally distinguishing between fake issues and genuine risks. It would mean no more talking out of both sides of one’s mouth on the safety of GMOS, which only emboldens the most reckless anti-science activists. And yes, it would mean potentially alienating some of his adoring fans who have are attracted to the flame-throwing side of his argument. Because of his international prominence, Pollan has an opportunity to be a transformative figure and not provide cover for the anti-science wing of GMO critics. Call them out! As Dan Fagin, director of the Science, Health and Environmental Reporting Program at New York University writes in a guest blog at Scientific American, “It’s long past time…for those of us who see ourselves as environmentalists and technologists to start making some crucial distinctions—and to broadcast those distinctions loudly and proudly.” But not everyone has the guts enough to risk their fame and fortune to do the right thing. It’s Pollan’s future to choose. He could end up, as viewed through the prism of history, as a tattered icon of an era when hysteria about GMOs trumped the empirical evidence—or he could emerge as a leader for positive engagement on crop biotechnology. He could be a teacher or demagogue. It may sound hyperbolic, but Pollan literally ccould save lives, if he has the courage to do so. Stand up for science, Michael.